Being a graduate student has its perks. 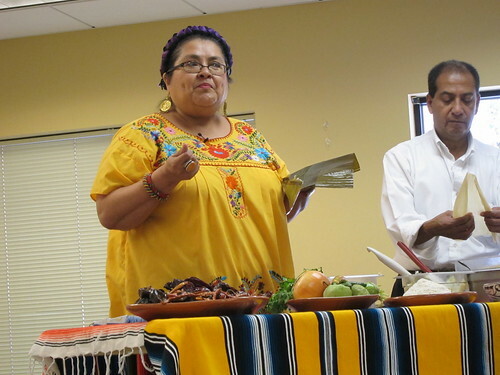 Sometimes it's pretty random, like the time Mama from Mama Hot Tamales came to Caltech show us how to make tamales. 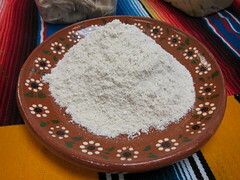 To prepare the masa/dough: combine the maseca, baking powder, and salt. Add chicken broth, knead well with your hands to form dough. In a separate bowl pour cooking oil and add dough, 1/2 cup at a time, to the cooking oil, and mix until thoroughly combined. Take about 30 corn husks and soak in warm water until soft, then separate. To Prepare Meat: Cook 1 to 1.5 lbs of chicken for approximately 1.5 hours. Let cool down then shred. Put aside into a bowl. The recipe for the salsa verde is not given here, so you might want to find that somewhere else or just buy some. Depending on the size of the corn husk leaves, place 1 or 2 husks cupped in one hand, with the broad side facing you. Spread approximately 1/4 cup of masa on the center of the leaves, then place approximately 2 oz of shredded chicken and 1 tbsp of the green sauce over the chicken. Leave about 1 inch of the husk on the right and left and about 3 inches from the top. Use the broad part of your thumb to press the masa smoothly in place. Fold the sides of each corn husk to the center. 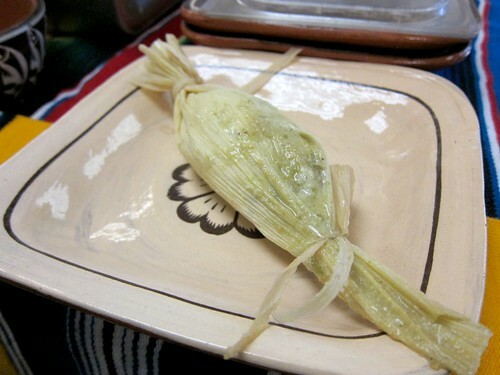 To secure the tamales for steaming, either fold the ends of the husks over at the top and bottom or tie the ends with a thin piece of corn husk. Place tamales upright in a steamer or a large pot with a rack. Pour boiling water to just under rack level. Cover and cook, with simmering water over low heat for about 1.5-2 hours. It was nice to see you in San Diego, I've been eating Korean food ever since, even for breakfast today!